Slide names help manage and identify slides better. In ActivePresenter 7, you’re free to change slide names with very simple techniques. Let’s learn how to use them in this today’s tutorial. The Timeline pane when you click All Slides. The Go to Slide list when you create the “Go to Slide” action for any object. 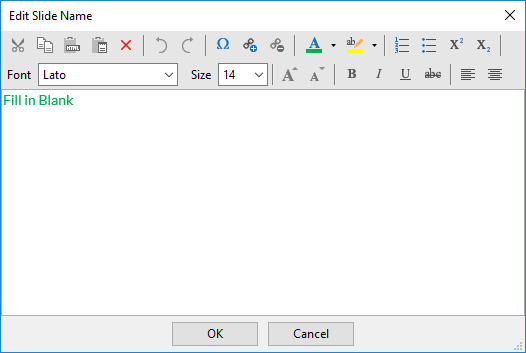 The outline when you export projects to HTML Slideshow, PDF, Word, Excel, and PowerPoint. The table of content (TOC) when you export projects to HTML5 simulation. With these in mind, you should consider adding descriptive names to your slides. Note that every newly inserted slide has an automatic name such as “Slide 1” and “Slide 2”. To change slide names, you’re given two ways. First, change slide names from the Properties pane. Second, generate slide names from the first shape. Step 1: Select a slide. Step 2: In the Properties pane > Slide Properties tab > General section > enter a name in the Name box. To add notes or comments, type your text to the Description box. To format the slide name in a visual way, click buttons (1 and 2) at the right of each text box. Then, a rich text editor opens. Clearly, this editor contains a lot of commands to style slide names. So, make sure you use them to create your favorite slide names. There’s another way to edit slide names. Just right-click any slide or access the View tab > Slides in Titles . Then, you see titles of all slides in the Slides pane. Right-click a slide > Edit Name to launch the editor like above. You can change the names of many slides at once. Just select them simultaneously and do the same above steps. But be careful because in this way, all selected slides have the same name. Step 1: In the Slide tab > Batch Operations > Generate Slide Name From First Shape. 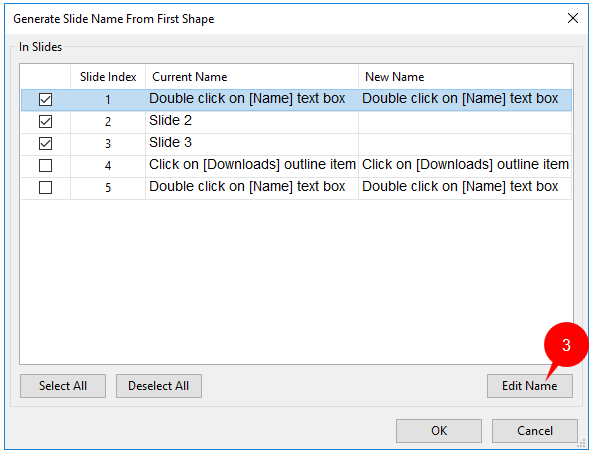 Then, the Generate Slide Name From First Shape dialog appears. The Slide Index shows the slide numbers. The Current Name displays the current name of each slide. The New Name shows the text inside the first shape of each slide as a new slide name. To rename slide, double-click a name in the New Name column. Or, select any row > Edit Name (3). When you’re done, remember to select its corresponding check box to apply the change. Or click Select All to rename all slides. That’s all! From now on, remember to use slide names when creating projects with ActivePresenter 7. Follow our Tutorial page and blog to get more useful tips and tricks about using the app.